Are you aware of the most common condition that women are faced with after giving birth? It is said that over 60% of women are suffering from a postpartum condition called Diastasis Recti or Abdominal Separation. Diastasis Recti occurs when the abdominal muscles begin to separate, usually occurring towards the middle to later part of pregnancy. As your baby gets larger, your body is diligently working to create more space to accommodate the growth. Weeks, months, or even years may go by, and you may continue seeing an abdominal bulge. In addition to having an abdominal bulge, you may be symptomatic in other ways, such as lower back pain, digestive discomfort, and urinary incontinence. Although this condition is very common, it is often not talked about frequently. Dr. Rahban highly values the importance of staying educated on what is occurring within your body. Whether this is your first time researching surgical interventions, it's vital to have fundamental knowledge about this common yet often misunderstood diagnosis. If you live in the Los Angeles area, you can set up an in-person consultation with Board Certified Plastic and Reconstructive surgeon, Dr. Rady Rahban. A large majority of Dr. Rahbans patients reside out of state in which virtual options are conveniently made available as well. Diastasis recti is a condition where the abdominal muscles permanently separate, leaving a gap between the left and right muscles. As previously mentioned, this occurs with nearly all pregnancies, to varying degrees from mild to severe. The condition is generally diagnosed during the second or third trimester of pregnancy. Often times the muscles do not return to their original state after giving birth despite consciously working on diet and exercise. Sometimes months or even years after having a baby, postpartum woman will continue noticing abdominal weakness and can physically feel a gap in their abdomen. Diastasis recti is a diagnosable condition when there is a separation present of at least 2 finger widths or beyond between the two sides of the rectus muscles. 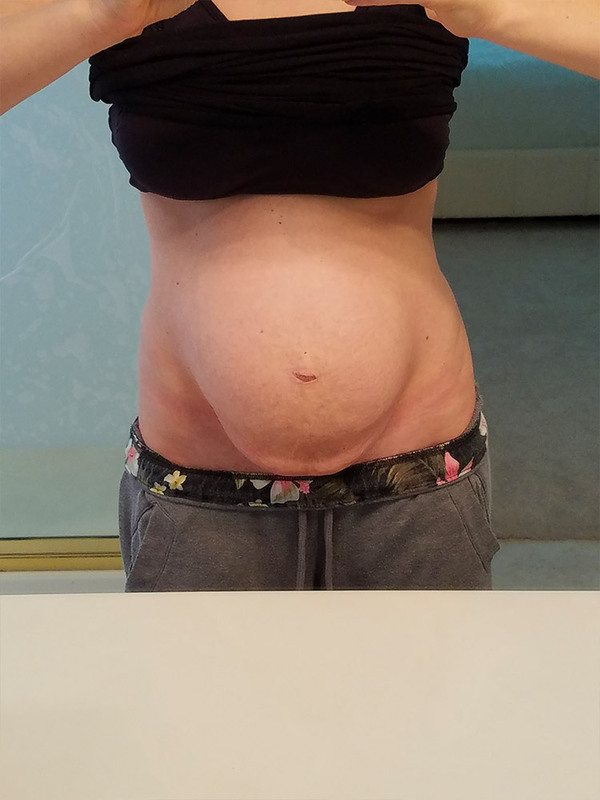 If you have diastasis recti, the most common visible symptom you will notice is a protruding abdomen resembling your pregnancy belly. You may also notice “tenting” or “doming” of the abdomen when doing simple things such as laughing, coughing, or sitting up. Diastasis recti is not only about having a visible stomach pooch, and can be symptomatic in other areas. Due to the weakness and damage to the connective tissue other symptoms such as lower back pain, digestive discomfort, and urinary incontinence can be present. 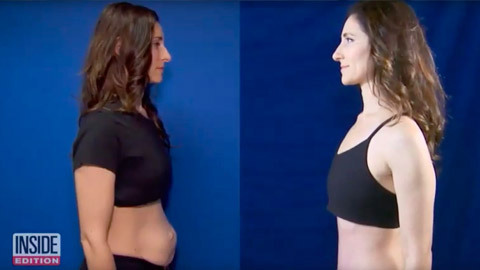 In more severe cases of diastasis recti, the remaining connective tissue between the left and right sides of your abdominal muscles are damaged and extremely thinned out to the point of no return. It is also common to note that a hernia can coexist alongside diastasis recti which can be potentially dangerous. A hernia differs from diastasis recti in that it is an actual hole in the connective tissue. The potential complications from diastasis recti and hernias signifies the importance of seeing a highly skilled, Board Certified Plastic and Reconstructive surgeon to perform your surgery. When undergoing diastasis recti and hernia repair, it’s important to be correctly diagnosed by a qualified doctor who has extensive knowledge of the anatomical and physiological implications of these conditions. Sometimes patients come to Dr. Rahbans Beverly Hills office inquiring about non-surgical ways to treat diastasis recti. Although there is some evidence showing that certain types of exercises may help overall function, at any given point in time the separation may return. Often times fully healing the damaged fascia is not possible without surgical intervention, as it addresses the root of the issue. As you learn more about your abdominal separation, it is vital to be informed of the exercises that can worsen the condition. In fact, some of the more common exercises that you may be tempted to try such as sit ups, crunches, planks, and certain yoga moves, can actually increase abdominal pressure and worsen the separation. Surgical intervention is proven to be the most viable and sustainable way to repair the separated abdominal muscles after childbirth in order to regain a functional, strong, and lean abdominal wall. With the understanding that surgery is the best treatment option for diastasis recti, it’s important to discuss what the surgery actually entails. Dr. Rahban makes a low incision, below the bikini line allowing him access to the separated muscles as well as the hernia. The fascia is plicated by sewing the weakened and thinned connective tissue to the midline. In doing so, this will provide the necessary reinforcement to pull the muscles back to their original destination and therefore the gap is eliminated and strength is restored. You will notice that once this is done, the symptoms associated with the condition are gone. This procedure closely resembles that of a tummy tuck. Technically, diastasis recti surgery and a tummy tuck are similar in many ways as they both address the muscle laxity and separation of the abdominal wall. In addition to the muscle repair, a tummy tuck also includes the removal of excess skin and fat, as well as the reconstruction of the belly button. This surgery requires very keen and meticulous execution in order to obtain optimal and long term results. A critical component in Dr. Rahbans approach to treating diastasis recti, is that he does NOT use mesh. Surgical mesh is a screen like material made of synthetic polymers or biopolymers, which are used as reinforcement for tissue and bone. There is substantial evidence demonstrating why eliminating the use of mesh is an ideal option. The use of mesh in diastasis recti repair, has been linked to infection, obstruction, significant pain, and perforation. Mesh has been known and recalled in the past due to these concerns. Other more problematic long term associations with mesh are that it can cut through your tissue, causing chronic pain and irreparable damage. This can lead to healing delays and further warrant additional surgeries putting the patient at higher risk for other complications. Dr. Rahban has extensive knowledge, experience and technical abilities in performing MESHLESS diastasis recti repair utilizing your own natural tissue. It’s important to know what to expect during your consultation with Dr. Rahban which are: honesty, attention to detail, thoroughness, all combined with a keen artistic eye. Dr. Rahban takes the necessary time to provide you with an in-depth examination of your abdominal region as well as an informative conversation regarding your particular circumstance. Dr Rahban wants to ensure that you are well educated in every aspect of your diagnosis, clear on your treatment options, and have realistic expectations. Dr. Rahban’s intentions are to provide you with the necessary resources to make the most informed and educated decision regarding your situation. He also values your concerns and addresses them with you so you walk away feeling confident in your decision to pursue diastasis recti surgery. After undergoing surgery to repair your diastasis recti, you can expect limited movement for approximately 2 weeks. You will want to give yourself the necessary time to rest and allow your body to heal. Ideally, you will take time away from work, and have support with daily tasks such as childcare, cooking, cleaning, and especially lifting. Approximately two weeks post op, many patients are cleared to go back to work but are to avoid strenuous activity and heavy lifting. By 4-6 weeks post op, you can begin to slowly resume all normal activities and are generally cleared to return back to the gym. It’s important to be mindful and nurture the recovery process to obtain the best possible outcomes and prevent complications. As part of the process, Dr. Rahban will give you the opportunity to thoroughly examine photographs of his patients, looking at his earlier work, so that you can see for yourself what to expect if he performs your surgery. He will tell you the results that you can expect from your surgery. It is important that you and your doctor agree on the aesthetics and mechanics of your surgery in order to obtain the results that you want. Call us today to schedule your consultation with one of the top plastic surgeons in Beverly Hills, Dr. Rady Rahban. For more extensive information on the the condition Diastasis Recti Click here.